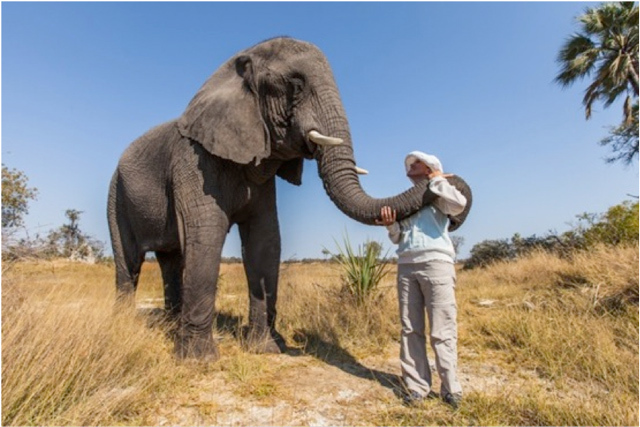 Walking with elephants in the wilds of Botswana made us feel more closely connected than ever before to these majestic creatures. 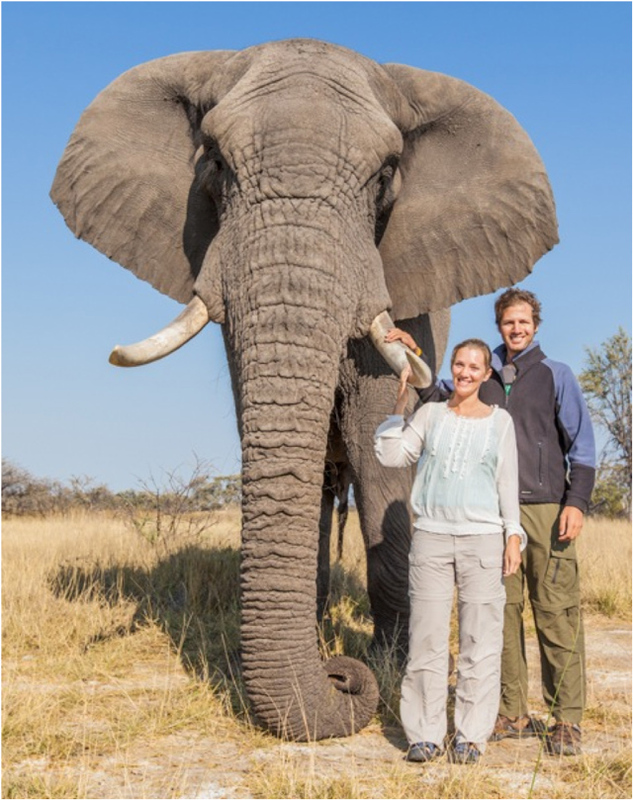 Deep in the heart of the Botswana bush, Doug and Sandi Groves live in a rustic bush camp with three fully-grown African elephants. Jabu, Thembi and Morula were orphaned at a tender age as a result of culling operations in South Africa and Zimbabwe. They were rescued by the Groves, and now live a semi-wild life together amongst the islands and floodplains of the Okavango Delta. Under the Groves' diligent care, the adopted trio have transformed from troubled young calves into the proud elephant ambassadors they are today. "Jabu, short for Jabulani, a Zulu name, means "happiness" and Jabu's zest for life is inspiring. Jabu is a proud and handsome bull who enjoys his role as alpha elephant of the small herd. He is kind, playful, generous, big-hearted and dependable. Of the three elephants he is the most independent and confident. He provides the girls with a steady anchor during times of concern. Jabu loves interacting and building solid relationships based on mutual trust and respect. He is predictable and unconditional in his giving. Jabu has always been a quick and eager pupil and his eyes light up at the prospect of a new challenge. He loves to please and is always ready to give of himself in any team effort. When Jabu first arrived he was barely waist high; now we spend our days looking up at him." "Thembi, short for Thembigela, is a Zulu name meaning "trust." Thembi is the sweetheart of the herd and the smallest in stature. Perfectly formed, pretty and dainty, Thembi knows a few tricks for getting her way. Smart and very social, she loves to be the center of attention. High on her list of priorities are being at the heart of her herd and having an abundant supply of food. Thembi is not easily separated from her fellow herd members and quickly becomes concerned if either of the other two wanders off. Herd security is of major concern to Thembi and she is the first to rally to the defense of her family against any perceived threat in her self-appointed role as protector of the herd. Participating in her development from insecure calf to a boisterous, vivacious adult continues to be a heart-warming experience." "When Morula first came to us she was a socially maladjusted and lonely 17-year-old. She lacked confidence and carried with her a lot of old baggage, which manifested itself in a variety of aberrant behavior. Always submissive in the extreme towards the younger elephants and to us, she vented her frustrations by creating twisted sculptures out of living trees. Although many a tree fell prey to Morula in her early days with us, her strongest personality traits have always been ones of great gentleness; she is mild-natured, sensitive and easily bruised emotionally. She can be described as a wallflower but she blossoms beautifully when love and attention are focused directly on her. She has become a blissfully contented 36-year-old, safe and secure in a unique herd whose bonds of kinship extend across the barriers of species." 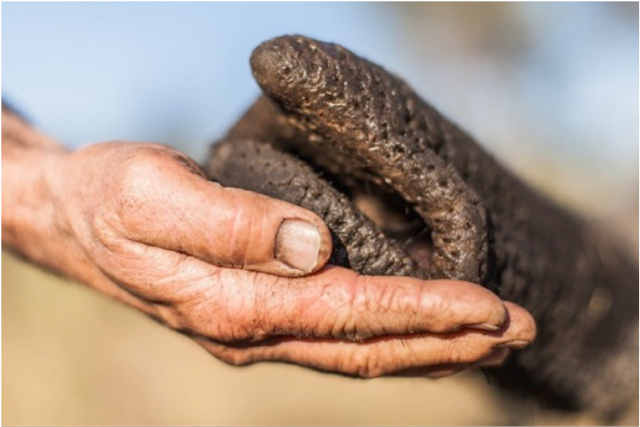 The Living With Elephants Foundation (LWE) fosters "harmonious relationships between people and elephants." As part of our stay with Sanctuary Retreats, we joined Doug and the semi-habituated herd on a daily foraging trek. 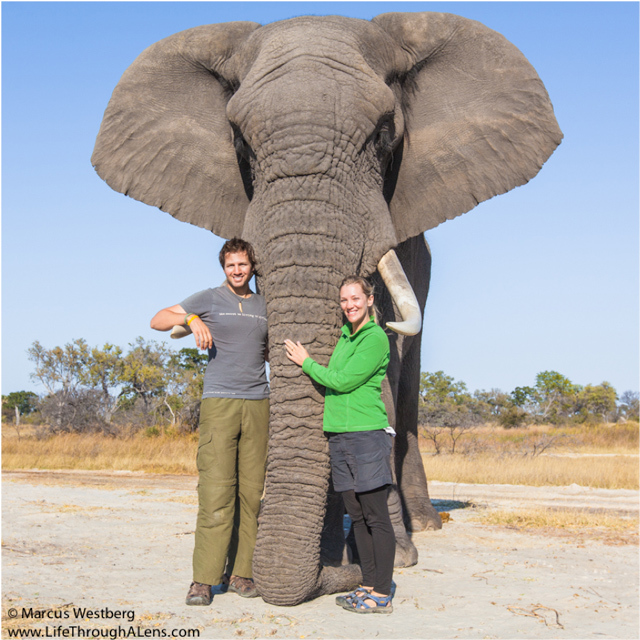 Walking in the gigantic footsteps of Jabu made us fully appreciate the size of these massive mammals. With Doug as our guide, we got to know the elephants from their wiry tails to the tips of their long trunks, stroking Morula's rough skin and the smooth ivory of her tusks. When Thembi, the smallest herd member, placed her trunk softly on our shoulders, we looked up into her warm brown eyes and lost our hearts to these gentle giants. 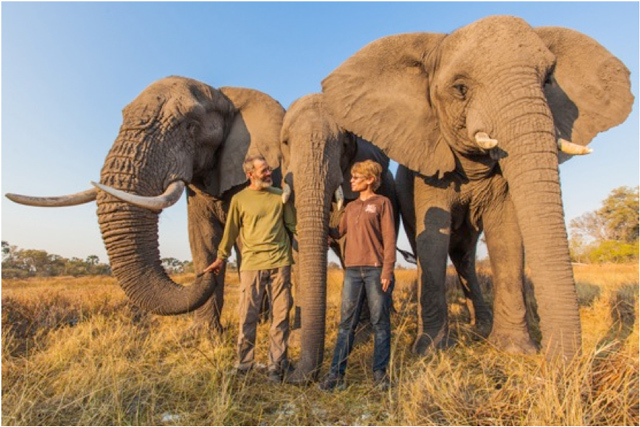 Over a span of two decades, the three elephants have become family for Doug and Sandi. During the time we spent with the herd, we saw the close family ties between the Groves and their adopted trio, shown through simple acts of kindness such as a gentle word from Sandi or the slight touch of a trunk. The Groves' commitment is complete, and Doug in particular rarely spends a single day away from Jabu, Thembi and Morula. Doug's favourite part of the day is when he leads the elephant trio into the bush to look for food. We joined the herd on a foraging trek, walking alongside the three elephants as they fed peacefully on the lush foliage. Doug described the tusks and trunk as a giant knife and fork, used to strip leaves off branches and pull up palm fans. With his massive body, Jabu shook the trees while Thembi and Morula happily ate up the fallen palm nuts. We've heard the rumbling of elephants rolling across the plains, but we had no idea just how many sounds elephants can make. At the end of the walk, we sat down to a picnic lunch served by Stanley's Camp as the elephant trio fed on branches nearby. When we had all eaten our fill, Doug got Jabu and Thembi to demonstrate an astonishing array of snorts, trumpets and squeaks, seen here in a short video we took at the time. Doug and Sandi not only invite visitors like us from Stanley's and Baines' camps to spend time with their adopted trio, but also local villagers. 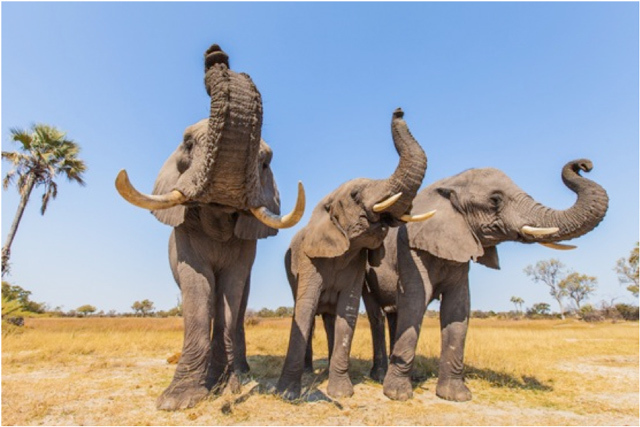 Conflict between farmers and elephants in Botswana and elsewhere in Africa means that children are often brought up to fear elephants. The Groves invite small groups of Batswana children to meet Jabu, Thembi and Morula, who soon come to realize that: "elephants can be friends." On meeting Doug and the elephants: "I was enchanted by the relationship and rapport that existed between Doug and the elephants. The concept that such a close, exotic and positive interspecies connection was possible had not occurred to me in my wildest dreams, and it was not long before the four of us were inseparable." 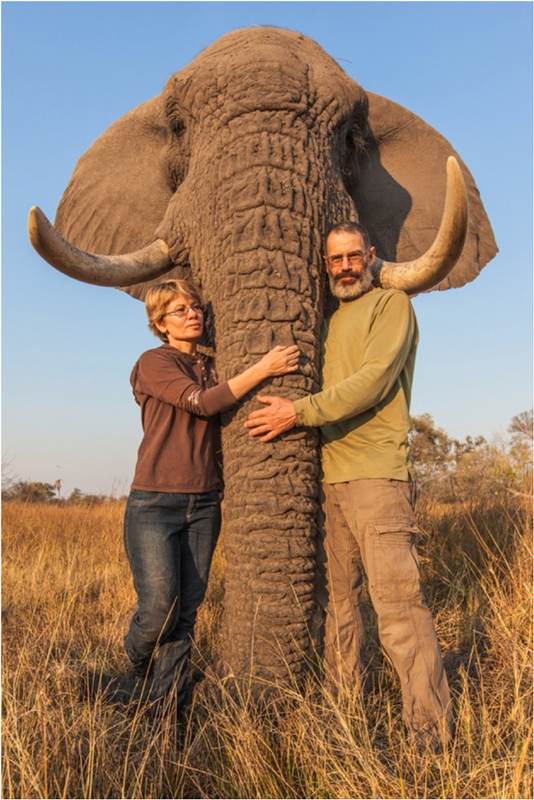 On adopting three elephants: "We initially tried to find homes for them, but finally - with my somewhat naïve but heart-felt prompting - we decided to adopt them ourselves, so that we could ensure a positive future and good quality of life for them. Doug was a little reluctant at first, being more aware of the huge commitment involved in providing for such large, intelligent and long-lived animals, but eventually agreed." On her and Doug's roles in the herd: "As human members of our interspecies herd we provide leadership, structure and security in much the same way as parents do for children. We place boundaries, but also offer encouragement and support. Our elephants seem to view us as benevolent parental figures as well close family members and friends." On a day in the life of the herd: "The elephants spend each dawn to dusk out in the bush wandering, foraging, mud bathing and doing the things elephants like to do. Great fun is also had in the summer months, wallowing and frolicking in the mud as a means of staying cool and keeping insects at bay." 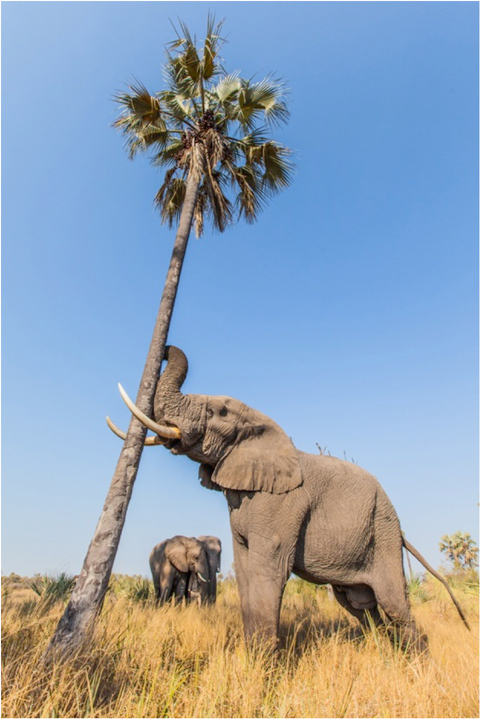 On what elephants like to eat: "Finding food is high on the priority list of Jabu, Thembi and Morula, and among their favourite delicacies are wild fruits such as palm nuts, morula fruit, jacket berries and sarma melons. During palm nut season Jabu goes from one palm tree to the next, shaking down nuts while Thembi and Morula eagerly help him gather and gobble them up." 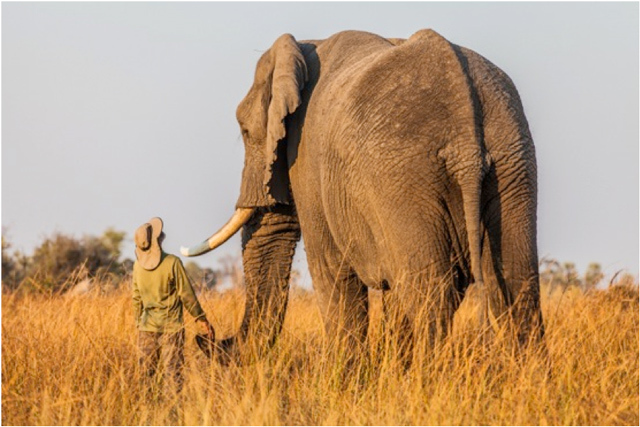 On encounters with wild elephants: "Most encounters are amicable, but males bigger than or of a similar size to Jabu sometimes consider him a threat to their status, and we will usually intervene to deflect these challenges." 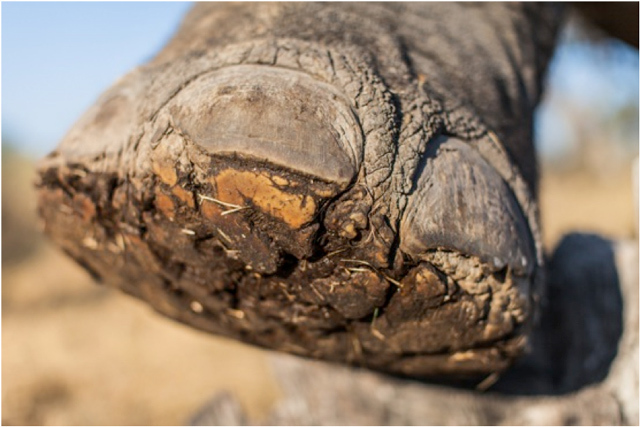 On human-elephant conflict: "In northern Botswana wildlife areas are quickly being transformed for agricultural use, and this represents a very real threat for biodiversity conservation. At the same time, wild animals threaten the livelihood of farmers who share range with them. Indeed, African villagers trying to grow crops and keep domestic animals in order to feed their families find it hard to appreciate protected wildlife reserves when elephants regularly damage their fields." On Botswana's elephant population: "As host to the world's largest elephant population it is vital that we do not allow ourselves to become complacent, as once the more vulnerable elephant populations farther north in Africa have been depleted, and if the insatiable demand for ivory remains, new hunting grounds will be sought by traffickers." 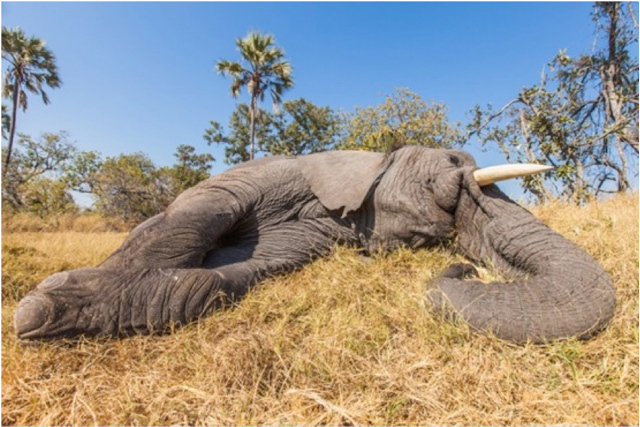 On elephant poaching: "The last ten years have seen a dramatic increase in poaching of all African elephant populations in Africa except for some healthy pockets in southern Africa. Estimated continent totals of elephants have gone from about 650,000 elephants down to just over 400,000 during this period. 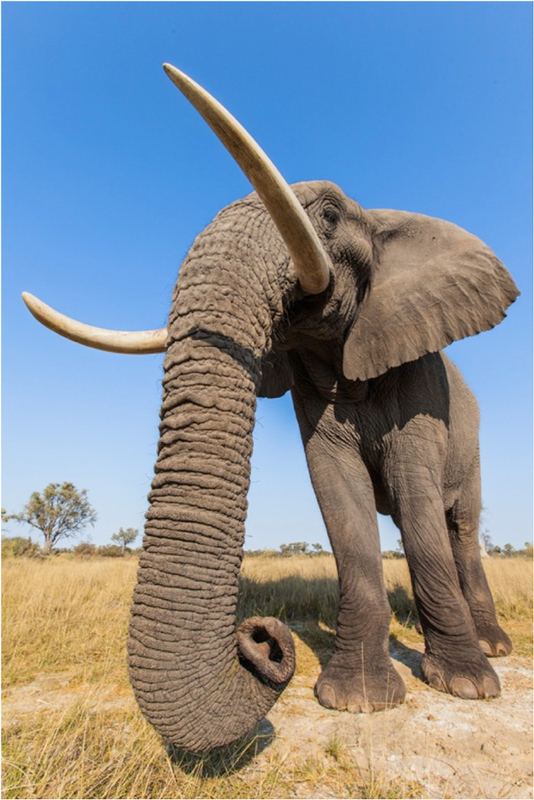 At current poaching rates, it is estimated that the African elephant could be extinct in as little as 20 to 25 years." On their outreach project with local children: "It is our hope that meeting Jabu, Thembi and Morula will foster a love for and appreciation of the intrinsic value of elephants and the natural world, and that in the future they will be equipped with the tools and passion to protect their splendid natural heritage." 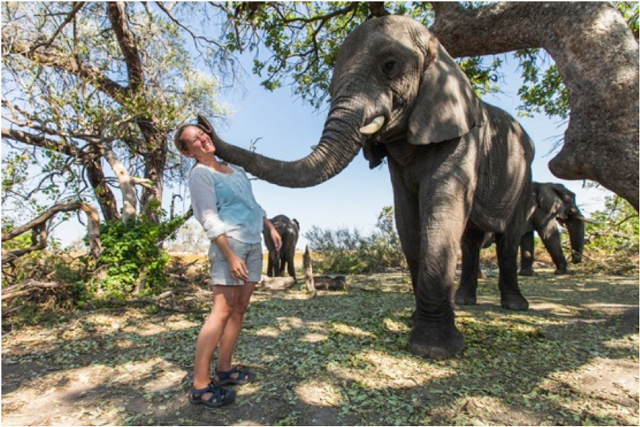 On working with Sanctuary Retreats: "It is our hope that by immersing guests -young and old, local and international - into the daily lives of African elephants we can foster respect and reverence for these phenomenal creatures, and that by enlisting our herd's enormous emotive energy we can encourage reflection and discussion on bigger planetary challenges, possibilities for conservation and our shared destinies." On the future of their adopted trio: "Elephants live an average of 65 years and given that Jabu and Thembi are both 26 years old and Morula is approximately 35 years it means that they are going to probably outlive us by decades. 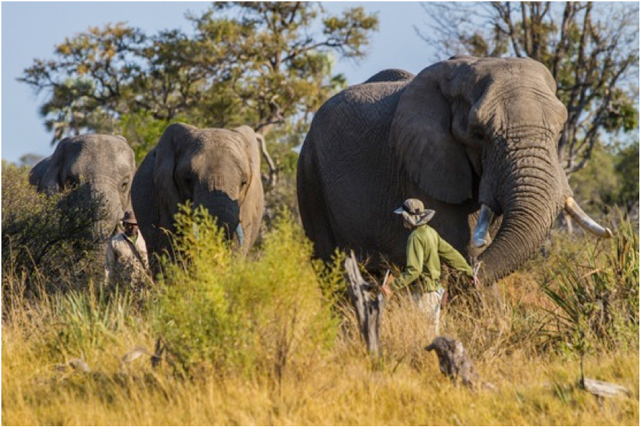 It is ultimately our plan to release them back into the wild at a point when we are no longer physically able to keep up with them, and on the proviso that the wilds of Botswana remain safe for elephants." 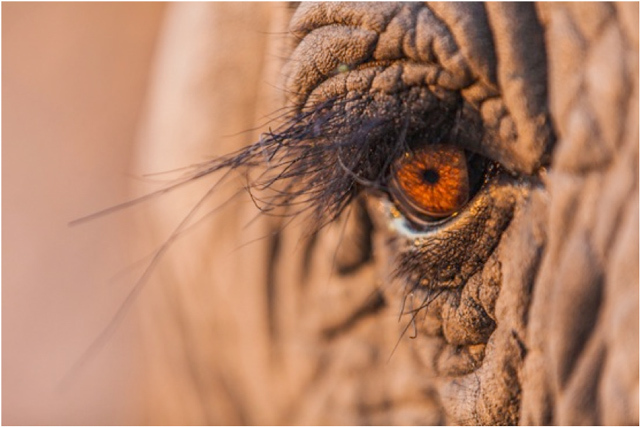 To find out more about the Living With Elephants Foundation (LWE) visit their website. To see more photos from Marcus and Kate, visit their website or follow them on Facebook.